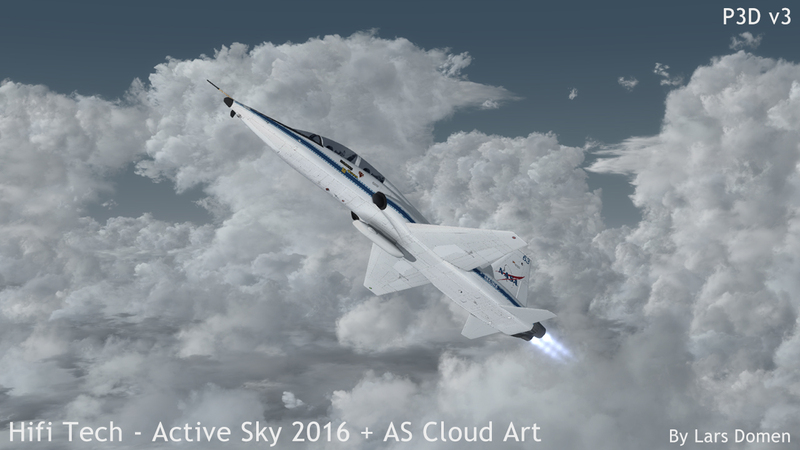 July 2016 saw the release of the latest in a long line of Active Sky products. 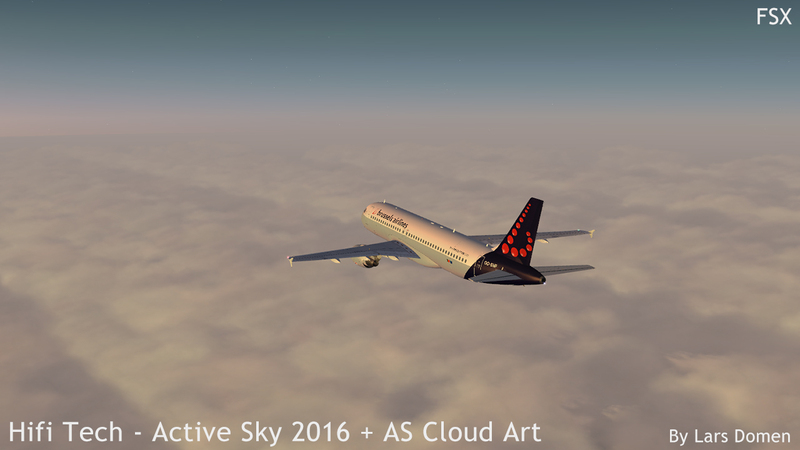 Active Sky 2016. Concurrently, Hifi Tech released an accompanying product: Active Sky Cloud Art. Let’s take a look. Hifi Tech’s Active Sky series has been around a long time. 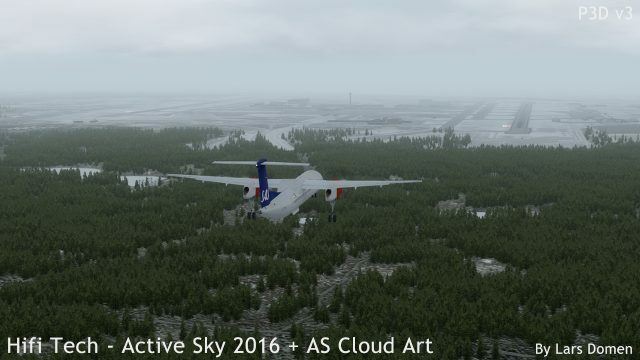 The basic promise of the series is well known: insert realistic and real-time weather into our flight simulators. The Active Sky series has a long standing reputation of excellence in this regard. Hopefully, Version 2016 lives up to the expectations. Active Sky Cloud Art is a new attempt by Hifi Tech to not only insert the weather into our sims, but also the way that weather is turned into visuals. 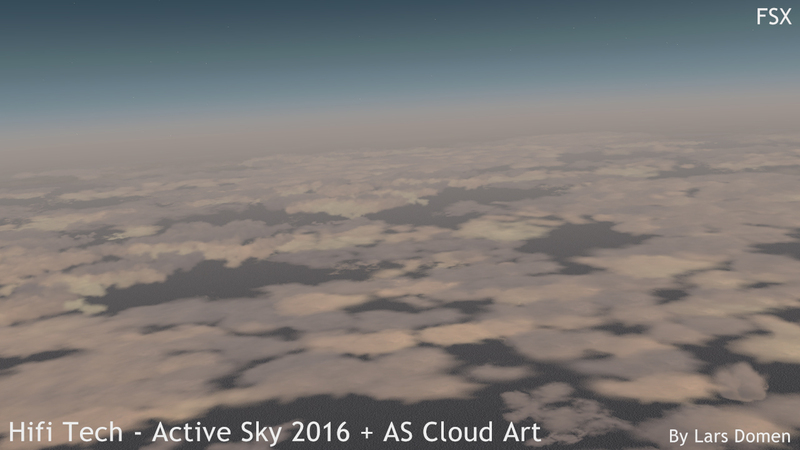 They previously included new cloud textures in some of their versions to achieve this goal. 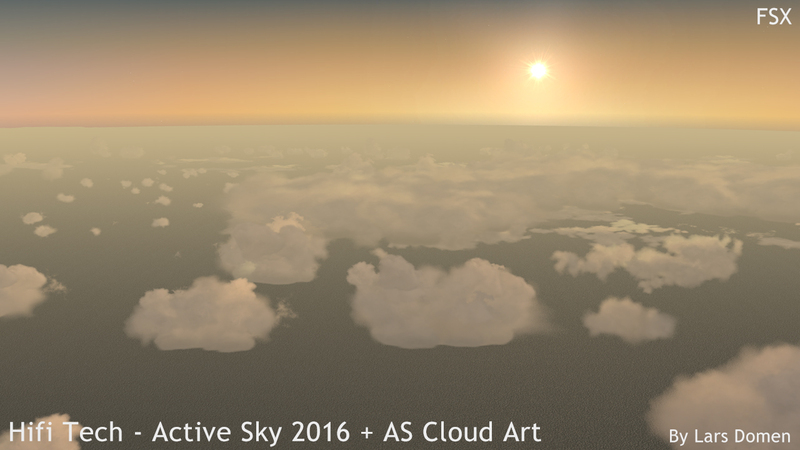 Active Sky Cloud Art (ASCA for short) is different in that it also changes some cloud models (instead of just textures). It also is a separate product, and thus purchase, from Active Sky 2016. 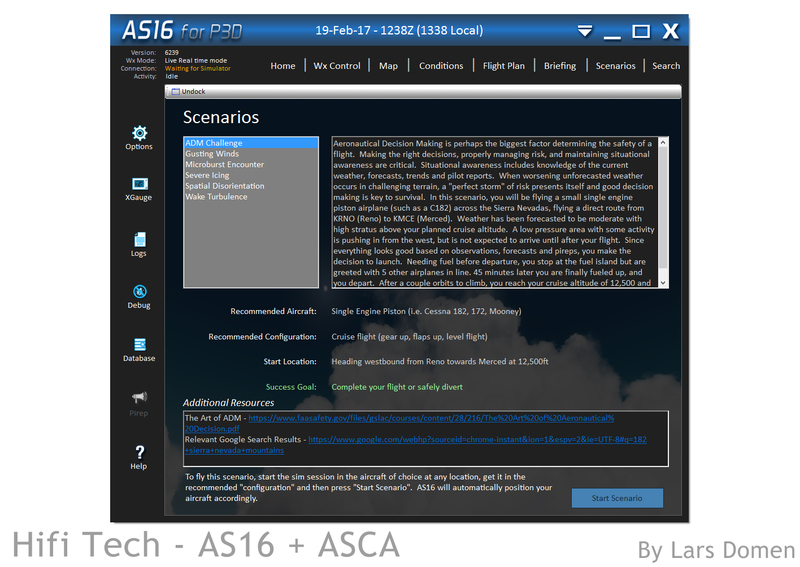 All screenshots in this review were taken using AS16 and ASCA in combination. 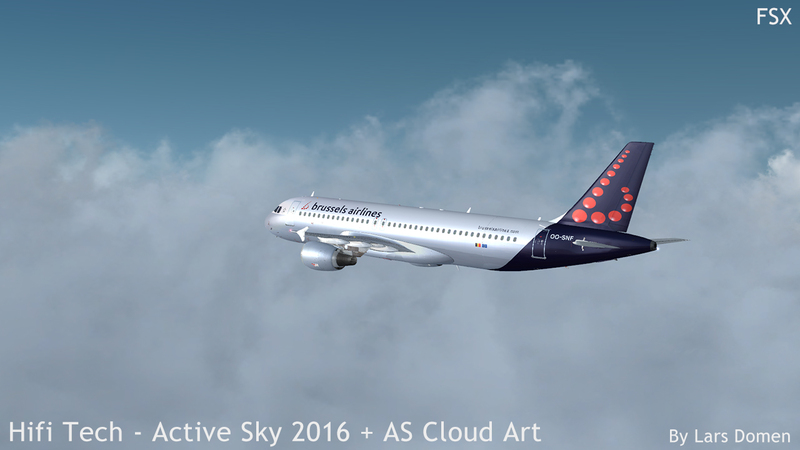 Also, much of my testing of AS16 happened concurrently with the FSX version of the FlightSimLabs A320, so you’ll see a lot of that aircraft in this review. First of all: compatibility. 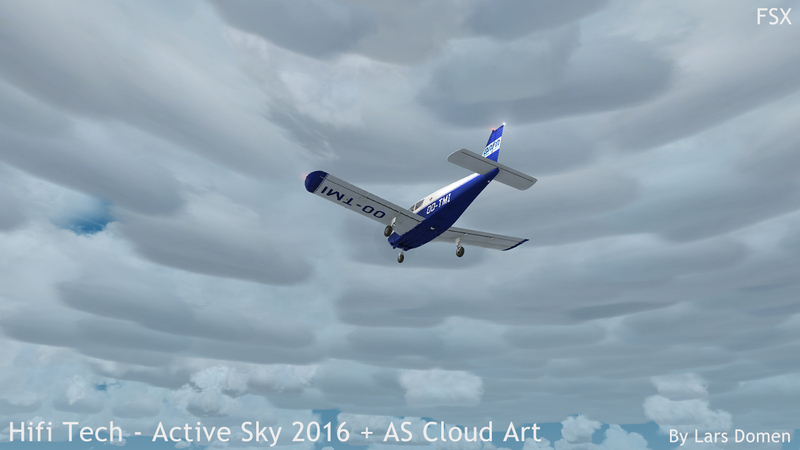 Active Sky 2016 is available in 2 versions. 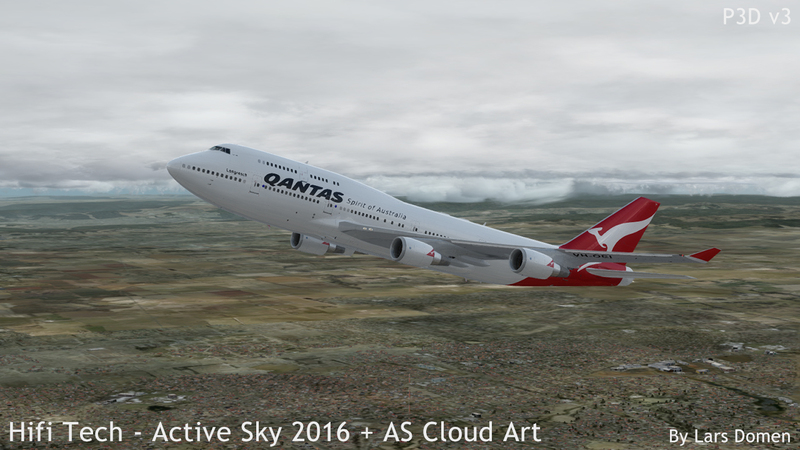 One for FSX (both boxed and Steam Edition) , and one for Prepar3D v3.2 and later. 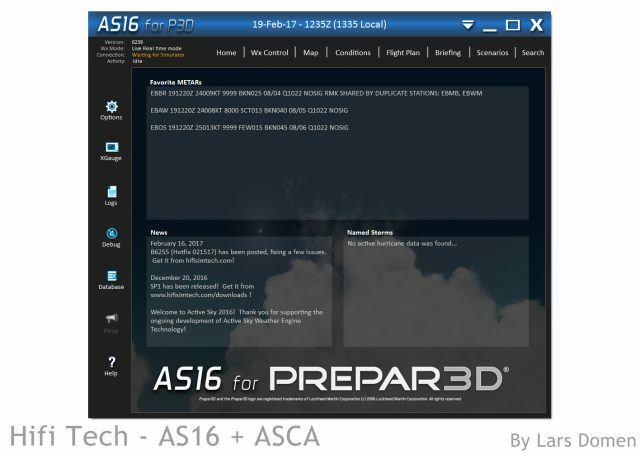 Please note that versions of P3D earlier than 3.2 are not supported, and are not likely to work at all. The FSX and P3D are completely separate purchases, and there is no bundle discount. Customers of previous Active Sky versions can get a discount though. ASCA supports both FSX and P3D in a single purchase. Note that you can request a fully functional, time limited trial for Active Sky on the Hifi Tech Website. When thinking about this purchase, I can’t help but compare to the first AS version I tried: Active Sky 2012. A whole lot of cloud replacement textures were included in this product. Or Active Sky Next, which got a P3D update for free. Additionally, the price for Active Sky 2016 has risen significantly over previous versions. The result is that, even with the discount for owners of previous versions, the price at checkout for me was still over €110. That was for the whole deal though, AS16 (Upgrade) for FSX, AS16 (Upgrade) for P3D and ASCA. For transparency’s sake: I did not have to pay this price, I got it for free in order to evaluate the product for this review. Once purchased, AS16 comes as a 230MB download. 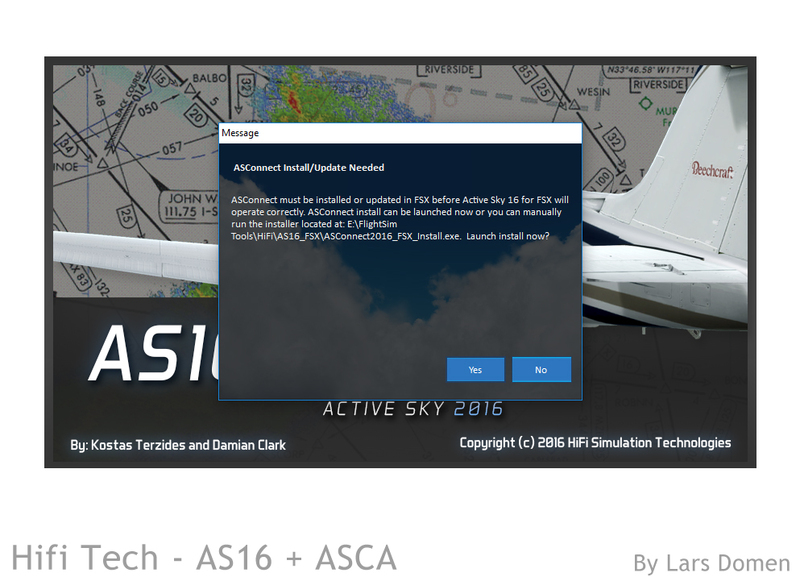 ASCA is a 720MB download, with an optional 1.12GB HD Content pack. Installation is very straightforward. Just run the installer, follow the steps and you’re good to go. Activation using a serial is done the first time you run the program. 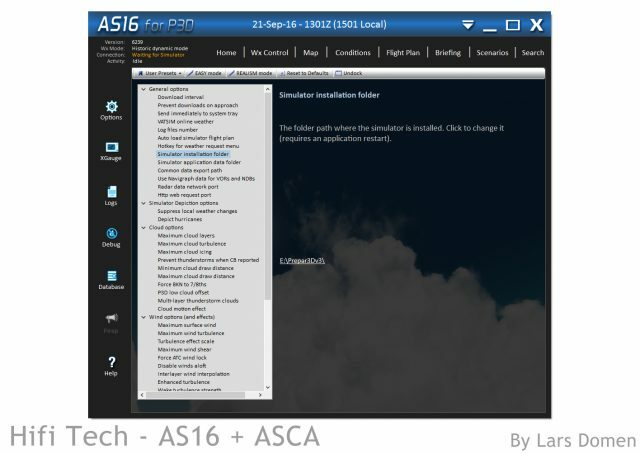 Similarly, on first run, AS16 runs the ASConnect installer, which installs some needed resources inside your simulator of choice. An additional convenience is that updates to AS16 can be installed on top of existing installations, which makes keeping the program up-to-date very easy. Hifi Tech has a good track record of numerous en prompt updates in the form of both hotfixes and service packs. Obviously, you don’t buy an expensive weather add-on just to fly in blue skies! 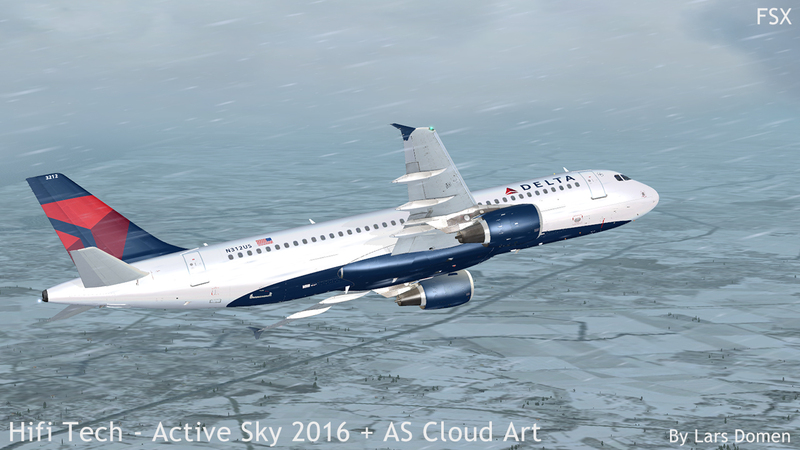 Low temperatures, high winds, clouds, snow, turbulence… It’s was all there on this flight! First and foremost, Active Sky is about injecting weather into your simulator of choice. This raises the question: how well does it do this? AS16, like its predecessors, of course doesn’t disappoint here. 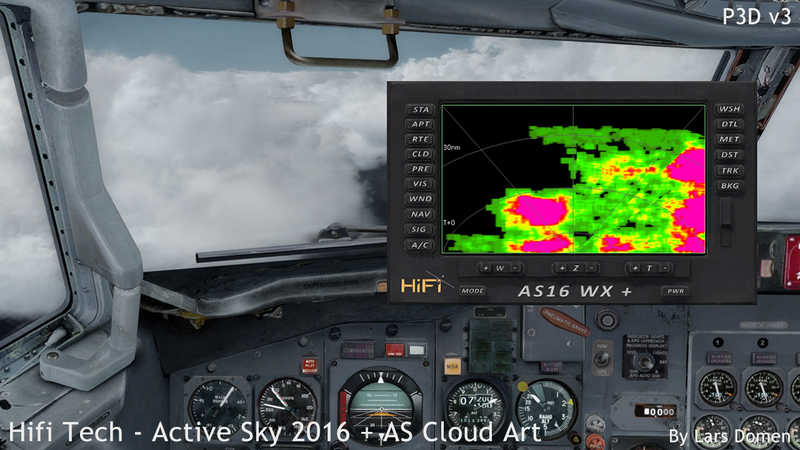 The revolutionary new weather handling Hifi Tech introduced with Active Sky Next, is returning tweaked and polished in Active Sky 2016. 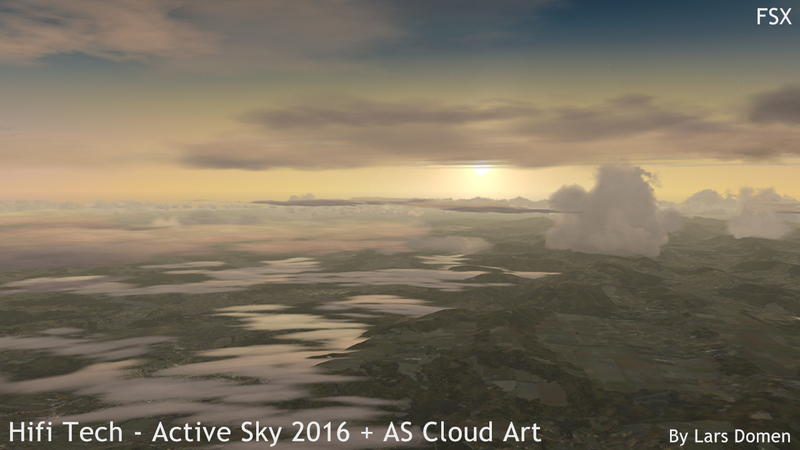 The weather that AS16 injects into FSX and P3D is remarkable in both its accuracy and smoothness of operation. On this latter statement, once you got the settings to your liking, you could just start the program before your flight, and never once think about it again until you turn off your PC. It’s that easy. Of course, there are a lot of possibilities to explore if you want to, but more on that later. Overcast! Nice, dense, uninterrupted overcast! Accuracy is of course hard to check in all respects. As far as the information in a METAR goes, AS16 replicates this perfectly in the simulator. Temperatures, winds, atmospheric pressure… All pretty much perfect. 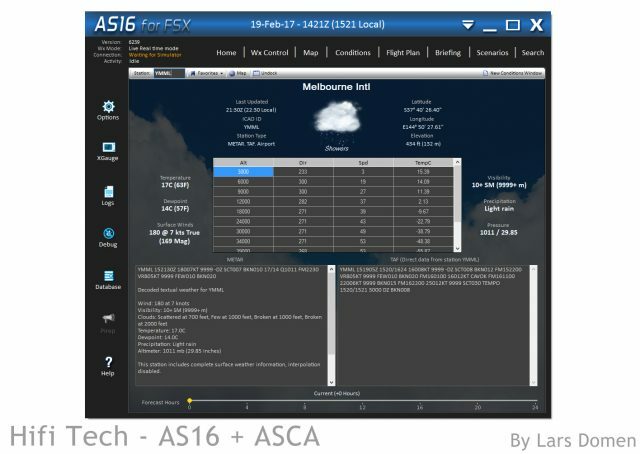 If the METAR has detailed visibility and cloud information, it’ll be visible in sim too. When this information is not present though (CAVOK conditions) I find that AS16 can be a bit more prone than perhaps necessary in introducing high altitude cloud layers. I first noticed this when I had perfectly blue skies outside my window, but quite a strong cirrus layer in the simulator, at an airport less than 10km from my home. But if that’s the biggest complaint I can come up with, that in itself may be quite the statement about the quality of AS16’s weather. I really like noticing the different weather patterns on a single flight. Notice the difference in weather on the left side of this screenshot, vs the right side. I’ve been using AS16 exclusively as a weather source the past couple of months. My overall impression is very positive. The weather feels quite immersive overall. But it is not static, it changes over time. Yet those changes happen very smooth and unobtrusive. So no sudden unexplained wind shifts, no cloud popping or stuff like that. Indeed, the only cloud popping I saw was when I manually forced a weather refresh. Climbing (or descending) through the flight levels similarly reveals no nasty surprises. 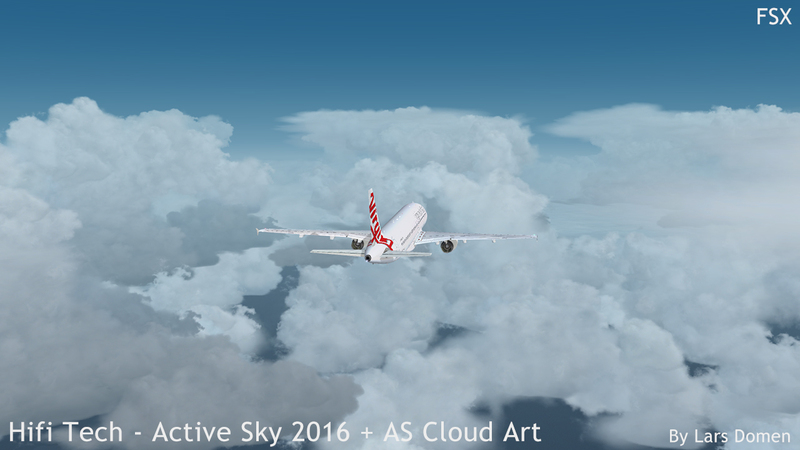 It feels just as realistic at FL300 as it feels at 2000ft. And then emerging out of the layer, and flying over an uninterrupted blanket of clouds. When looking at the more extreme weather situation, AS16 delivers some impressive storms. And when you fly through them, you’ll understand why pilots avoid thunderstorms in real life. 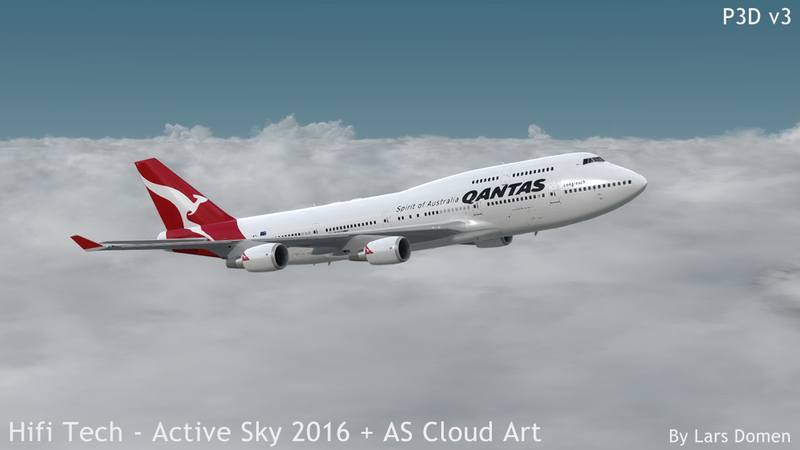 Unlike with default FSX weather, it’s quite hard to just ignore a storm in AS16 and fly right through it. Updrafts, downdrafts, turbulence, low visibility, icing… it’s all there. Of course, how much it affects your aircraft also depends on what you’re flying. 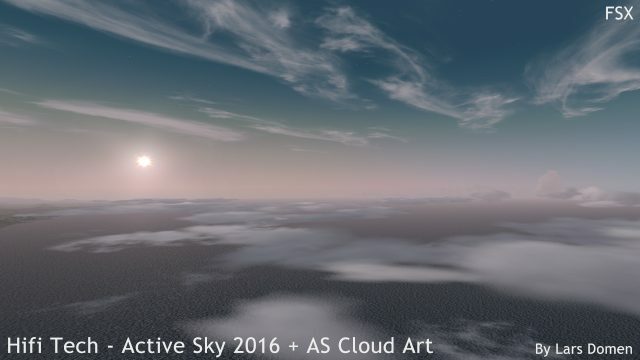 The Active Sky API’s are backwards compatible. Or in more understandable language: Active Sky Next based weather radars still work! 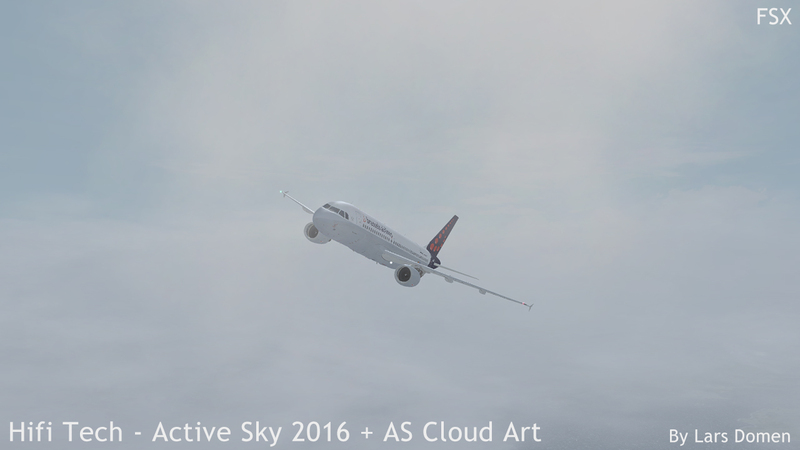 One final thing to mention is the ‘in-cloud’ low visibility simulation. 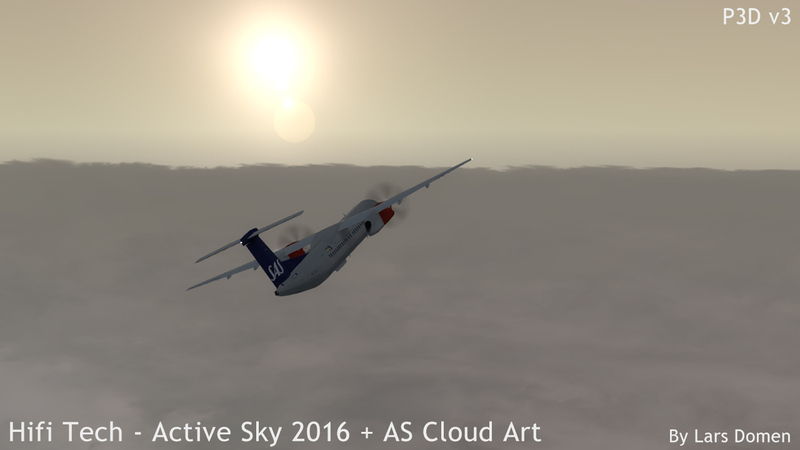 A new feature in AS16, it gives you a feeling of speed when flying through dense clouds. I liked it at first, quite a lot actually. But one of the updates along the way made the experience markedly less pleasing on my system than it was at first. I’m not sure what changed, but I’m seriously thinking of turning that option off for my own normal flying. The low visibility effect effectively spawns a small cloud right in front of your aircraft. Results vary in the VC for me, ranging from OK to very immersive. In exterior views, it looks a bit silly. But of course, it’s not meant to be viewed from there. If you first run Active Sky 2016, the program will check whether everything is set up correctly for it to work. If it isn’t, it’ll tell you so in a popup. Similarly, you’ll get a message if a newer version is available. 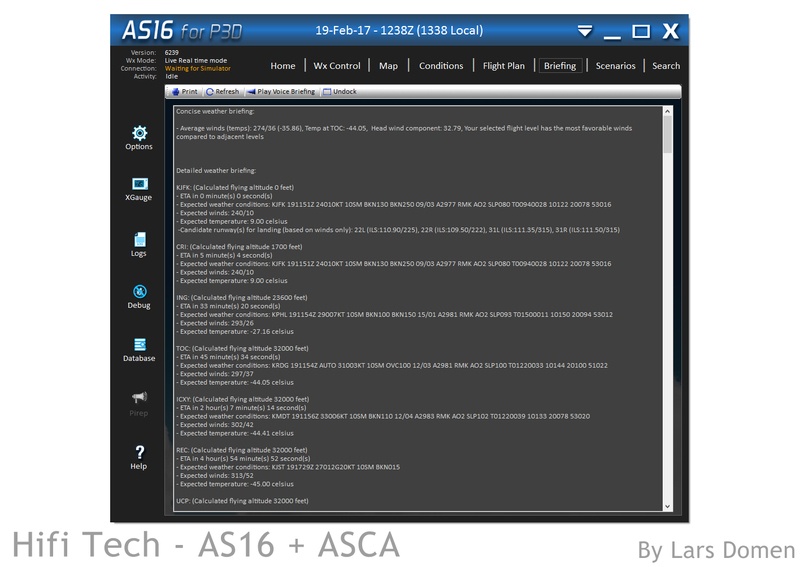 At first look, the AS16 User Interface is markedly different than the one from Active Sky Next. When looking closer though, you’ll notice that most of the changes are cosmetic. You’ll not have to look very far to find a lot of familiar pages. This clearly is an evolutionary update, not revolutionary. I’m not going to go over all pages individually, but I’ll cover those I consider most important. 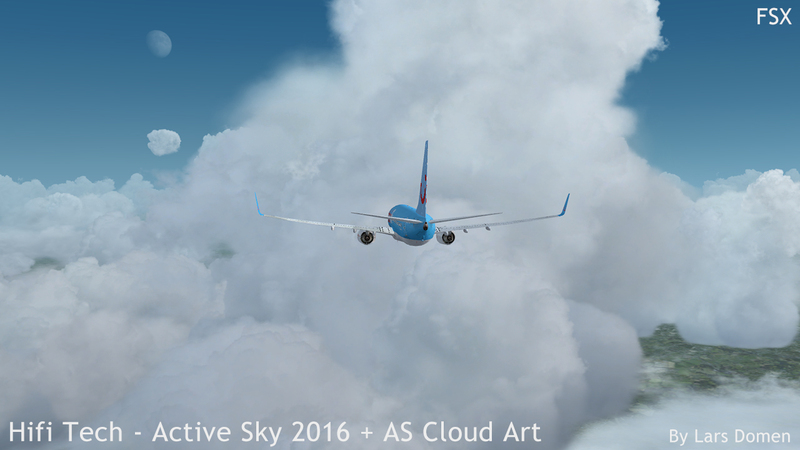 Starting Active Sky 2016, the first page you see is the home screen. This page provides a quick overview of important data: the METARs at your favourite airports (of your choice, this list will be empty unless you pick some favourites); the latest Active Sky News, primarily telling you about updates and stuff like that, and finally the active ‘Named Storms’, hurricanes and cyclones which will provide some interesting situations in their vicinity. Searching for ‘Thunderstorms’ on the AS16 search page directed my to Iceland, among other places. They weren’t kidding. Not nice flying weather! Also note the different look of the clouds compared to those in the screenshots earlier. 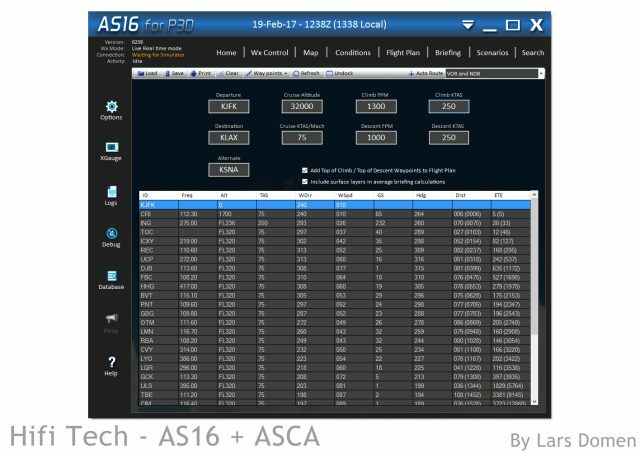 A nice example of the AS16+ASCA combination keeping things interesting. The Weather Control page lets you switch between Live, Historical and Custom weather. These options are rather self-explanatory. Live weather tries to match the current real world weather as close as possible. Historical uses weather from a past date (back to august 2014 when I looked in February 2017). Custom weather lets you create your own weather, and choose where to apply it. You can also save weather situations, and load them again on this page. The Conditions page is one I use a lot. It gives you a detailed overview of the weather at a selected station. There’s also a dropdown to select any of your favourite airports or, when a flightplan is active, departure, destination and alternate. While the Flight Plan and Briefing pages are separate pages, they are close linked in that the Briefing page requires a flight plan to be active. 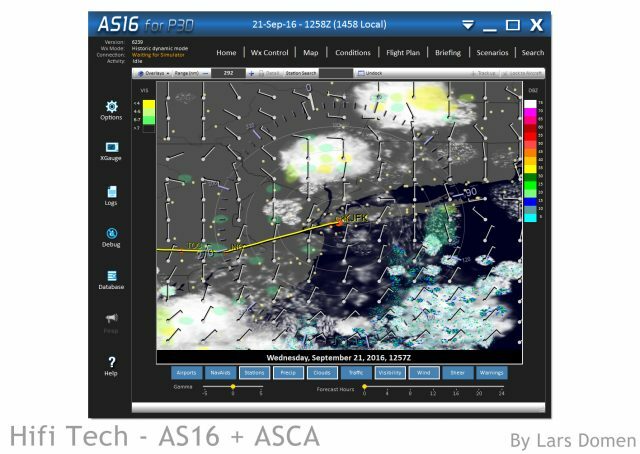 What the Flight Plan page does is quite obvious, but it has some features you might not immediately expect in a weather program. You can just load a saved flight plan and be done with it. 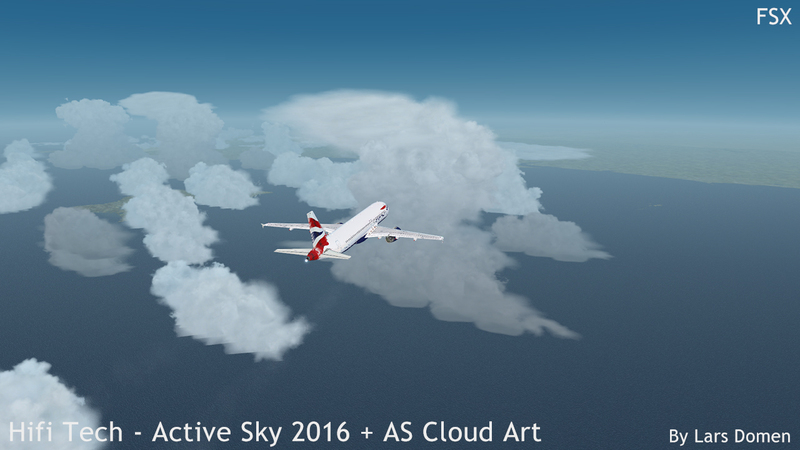 But you can also just enter departure and destination, and Active Sky will generate a flightplan for you. Quite neat if you want a quick flight without too much hassle, although you are limited to VOR to VOR, VOR and NDB or Direct GPS flight plans. If you enter your speed and vertical speed information, the flight plan will also show top-of-climb, top-of-descend and ETA information, including ETA at all intermediate waypoints. When then looking at the Briefing page, it’ll give you a very detailed briefing including weather and winds at all waypoints. The Flightplan page showing (part of) an AS16 generate flightplan from KFJK to KLAX. And the briefing page generated alongside the flightplan in the above screenshot. The map page can be used to give a visual representation of the available information. It can show clouds, precipitation, turbulence, navaids, your flight plan, and much more. It can also be used to create custom weather at a specific location. The map page, with quite a lot of overlays active: Clouds, Visibility, Precipitation and surface winds are shown. 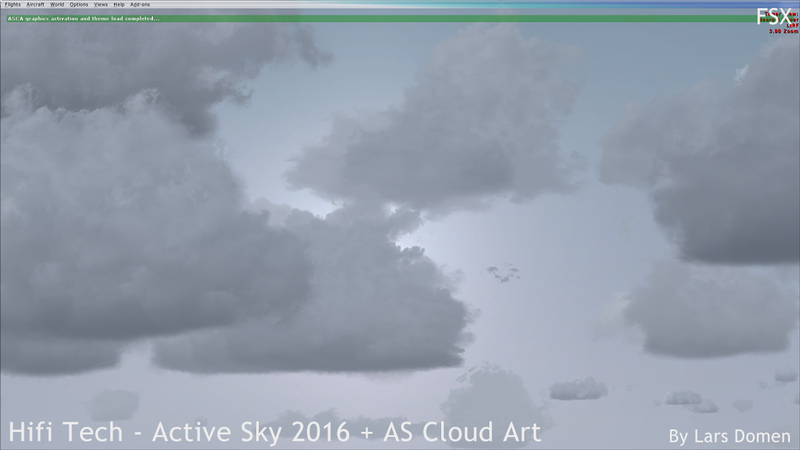 When looking at the options page, you’ll quickly notice the relation between Active sky 2016 and Active Sky Next. A lot of the option are familiar, but there are plenty new ones too. Options range from weather depiction over wind and turbulence scaling to audio and Active Sky warning options. There’s a lot here to tune the experience to your liking. You can also save presets, if you want different settings depending on what type of aircraft you fly, for example. 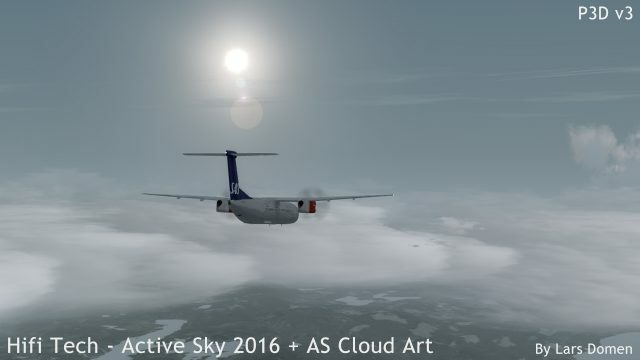 A new feature in Active Sky 2016 are Scenarios. These are a set of challenging situation where pilot might find himself or herself in, with the goal to safely get out of them. There currently are 6 of them, of which 5 are based on specific real world events, 4 of those ending in a fatal crash. How effective the scenario loads depend on the aircraft you use. Default or very simple aircraft should make this quite easy. Detailed add-on aircraft add some difficulty in the process, which is out of the hands of Hifi Tech. At first, I had limited interest in this feature. But after trying it a few times, I quite like it. It really puts you on your toes. I’d love to see more scenarios, or variations of the existing ones, show up in the future. 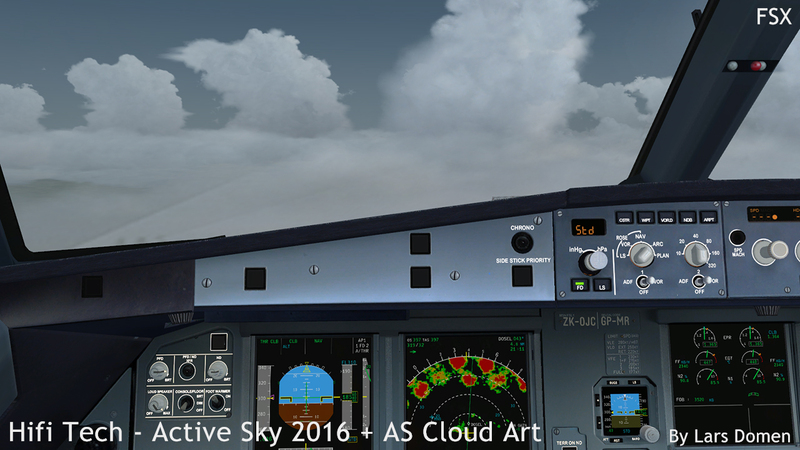 All in all, Active Sky 2016 is a very powerful program filled with features and capabilities. Personally, I probably only use a fraction of them in regular use, but it’s great that the possibilities are there. The Active Sky XGauge is still here! This 2D panel, installation of which is automated and extremely easy, can function both as the AS Map page, or like a weather radar. Active Sky Cloud Art is a stand-alone program (ie. it doesn’t need Active Sky to work) by Hifi Technologies to specifically change the visual representation of weather in the simulator. As they state on the product page, it changes everything ‘above the horizon’. This means: clouds, sky colours and lightning. 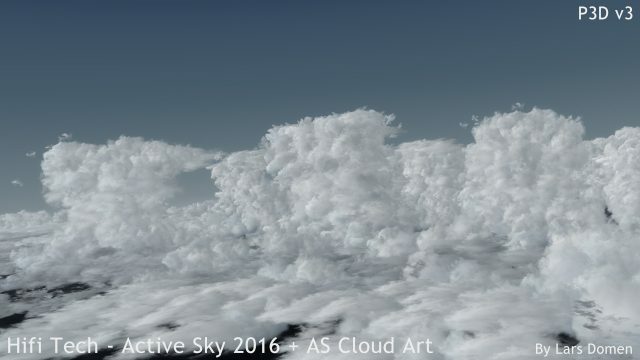 But, and this sets it apart from the competition, it also changes the 3D cloud structures. 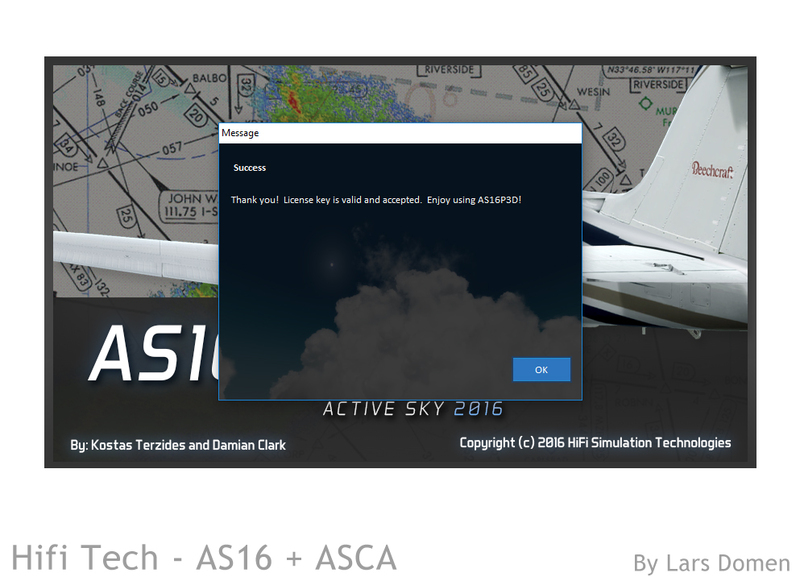 At first run, ASCA looks very simple and basic. But it turns out to be more than it at first appears. 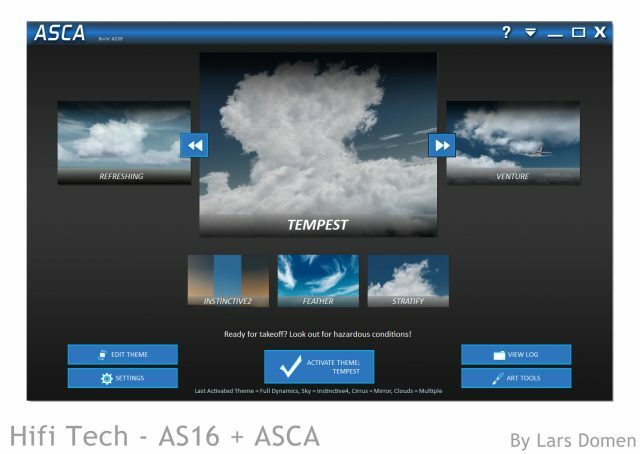 First, ASCA works on the basis of weather themes. These are collections of texture sets to provide a certain theme or feeling in the simulator. Several themes are available out of the box, and more can easily be created by the user. A theme exists of a certain set of Sky Colours, Cirrus Clouds and Cloud Textures. Not that you do not pick specifics, just sets. While not as powerful as picking specific textures, it’s a lot easier and faster as well. Although using ASCA is easy, there are some important settings and sliders on the options page. Very important here are the ‘Quality’ settings. These directly influence performance and memory use in the simulator. They’re easy to use sliders though, so it’s not too difficult to fine tune this over time. To use the highest definition textures, you’ll also have to install the HD content pack for ASCA. 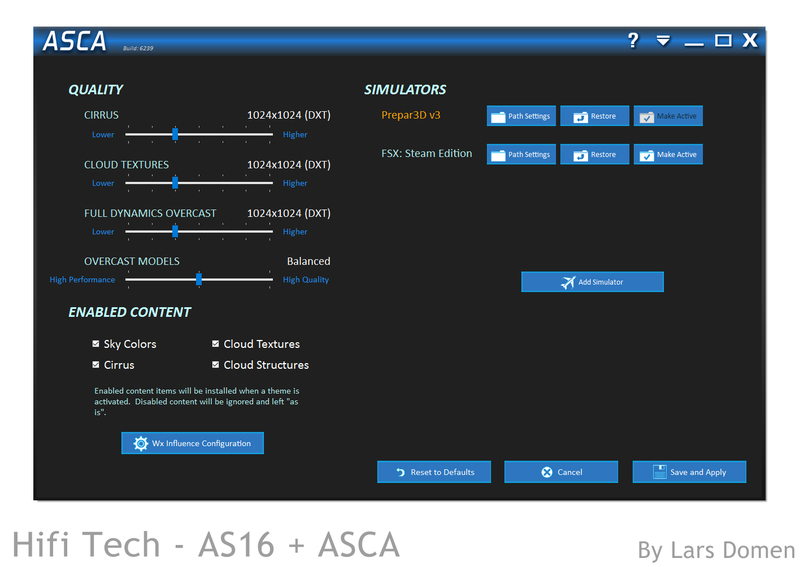 With ‘Enabled Content’, you can pick which features ASCA installs in the simulator, and allows ASCA to work well together with other texture replacement add-ons. Active Sky Cloud Art can be used without Active Sky 2016. It works well on its own, or with other weather add-ons. In this case though, it’ll just be another texture replacement add-on of which there are many already (although most are more expensive than ASCA on its own). In my opinion, it’s good, but not great. The choices are not very extensive and the user interface, while easy to use and very fast, limits how much a user can influence the end result. The same can be said about the cloud textures. Good, but not the best around. Definitely a big step beyond the default ones in FSX, but there’s better available. That being said, I am impressed by how ASCA models clouds. Even at medium settings, overcast looks really good, and thunderstorms are massive and intimidating cloud structures. 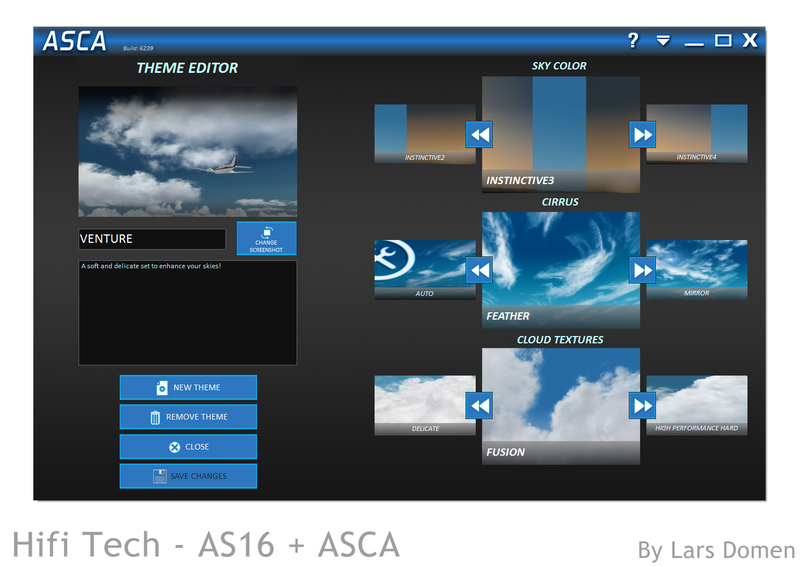 But when you combine ASCA with Active Sky 2016, it enables some features that set it apart from the competition. The AS16-ASCA combinations basically provides 2 additional features, but they’re big ones! First of all: dynamic texture reloading. This means you can load a different texture set live in the simulator. No need to quit and restart your simulator in order to use a different set of textures. If you’ve ever spent time trying to find a texture set you like, you’ll appreciate this feature a lot. The (optional) message at the top of the screen telling you new textures have been loaded. The second feature is related to the first. 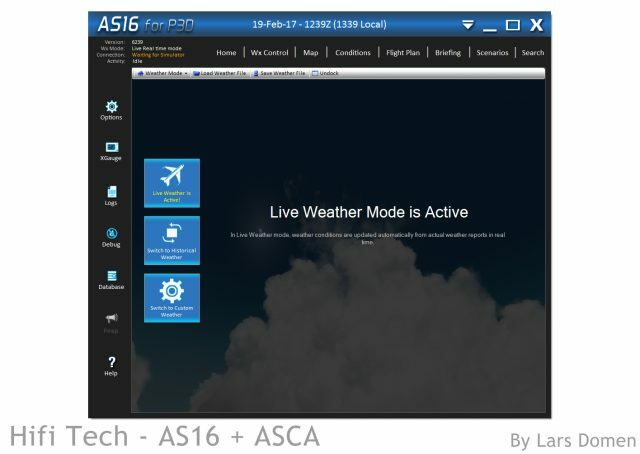 If you set ASCA to any of the Live Weather Themes, it’ll constantly communicate with AS16 to try and find the best fitting weather theme for the current weather, and periodically install that into the simulator. This is done in a way that tries to limit sudden visible switching. The result should be an appropriate set of textures at all times, and no visible switching. In practice, I’ve found that it indeed does this very smoothly. The visual result is pleasing, and I’ve only found switching to be noticeable if only little variation of clouds is visible in a scene. And even then it’s hardly obtrusive. Notice the different look and feel of the situation even on this short flight. Here during climb. And here descending to our destination, just 200nm from our departure airfield. With Active Sky providing weather, and Cloud Art providing high quality visuals, you’ve got the perfect combination for a whole load of performance and memory issues. And it certainly has the possibility to provide those if you just turn all options to maximum. If you’re more considerate though, you can achieve pretty smooth performance while still receiving a pleasing visual experience with very immersive weather. 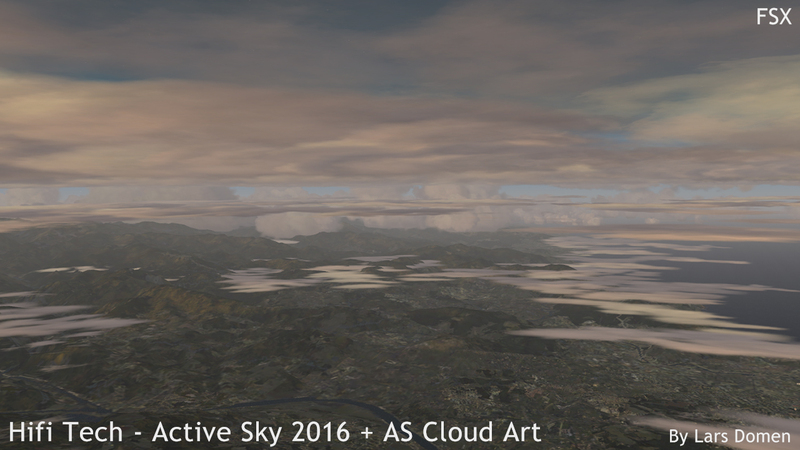 I found no performance penalties on my system that weren’t explained by the larger number of clouds visible in intense weather situations with Active Sky 2016. 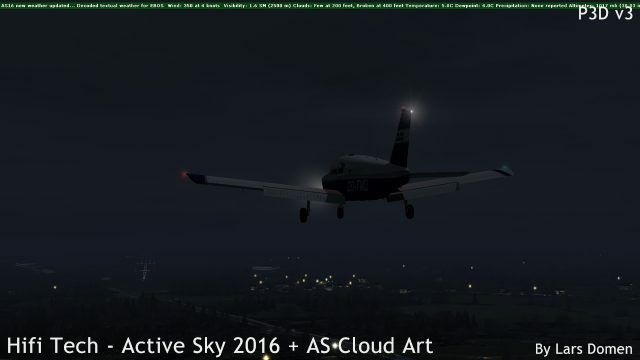 While I’m no fan of the pricing, or the fact that FSX and P3D are separate purchases without a bundle discount possible, I’m most definitely impressed by Active Sky 2016. It takes the great features of Active Sky Next and improves on those. It’s powerful, provides lots of options for fine-tuning and tweaking and delivers a whole range of features that aren’t strictly necessary, but are useful to have. 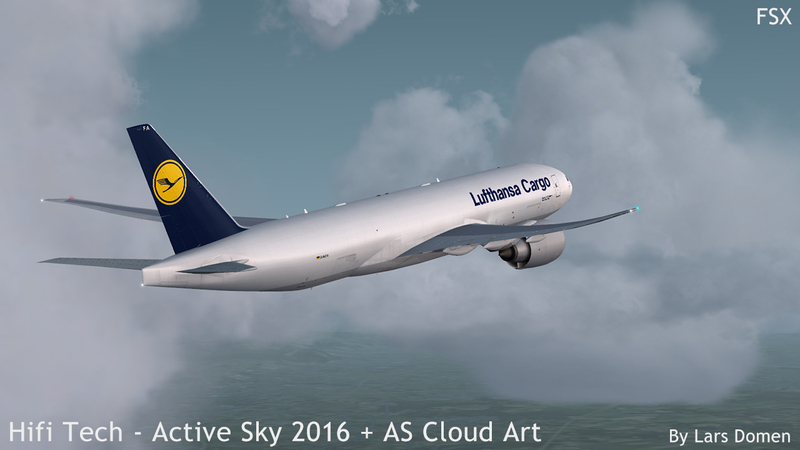 Above all, it delivers an immersive experience with realistic weather, and is easy to use. 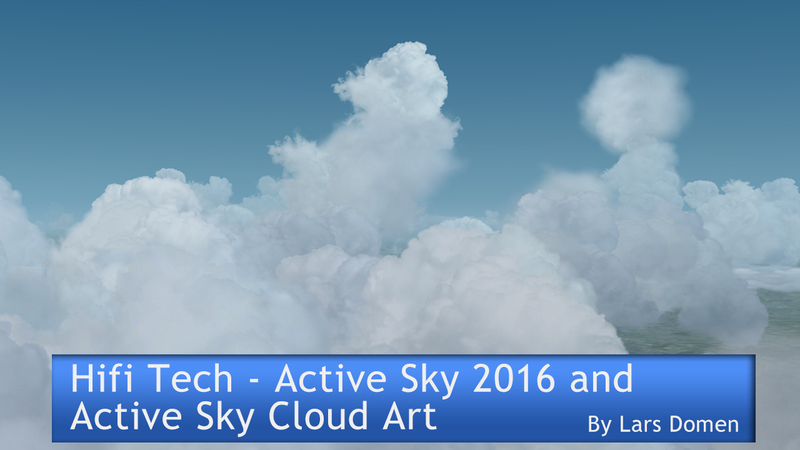 Active Sky Cloud Art is a program I wouldn’t recommend over the competition on its own. This changes in combination with AS16 though. 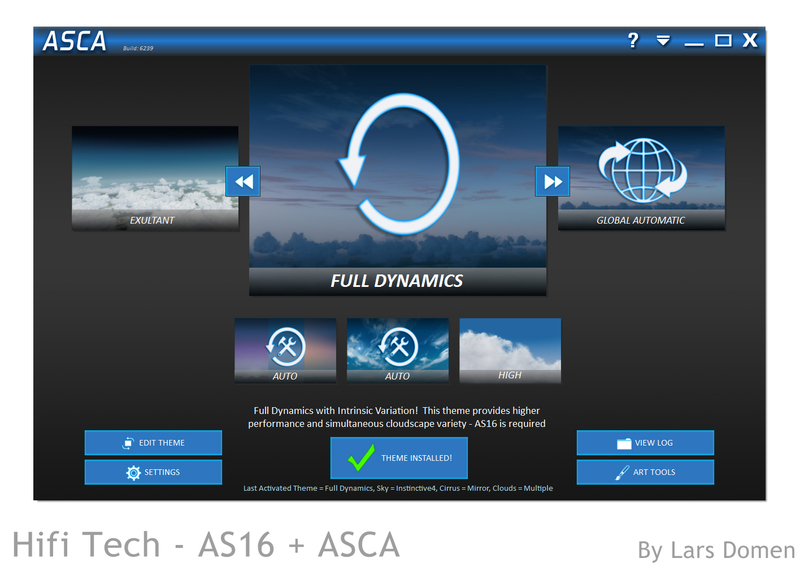 When using both together, there certainly is added value in ASCA. If you’re still on the fence about buying Active Sky 2016, I can wholeheartedly recommend the time limited trial. It’ll cost you nothing but some download volume and some time to setup, and it’ll give you a fully functioning AS16 for 7 days. Fully functional trial available for AS16. ASCA could do with a more powerful and user-adjustable selection tool for those who like to tinker. Lars, overall an accurate review as this user can attest. From a consumer standpoint, I feel it would have been more “price considerate” if the publisher could have somehow combined both programs into a single package. Especially after upgrading from ASN to this product as I did. I also agree that the visuals combine for a good if not fantastic flight experience. An issue I’ve experienced is that it seems very extreme on the turbulence factor. Good, honest review. Thanks for the comment Tom! The turbulence indeed seems extreme when using default settings. I recommend turning down the Turbulence Effect Scale slider a lot!